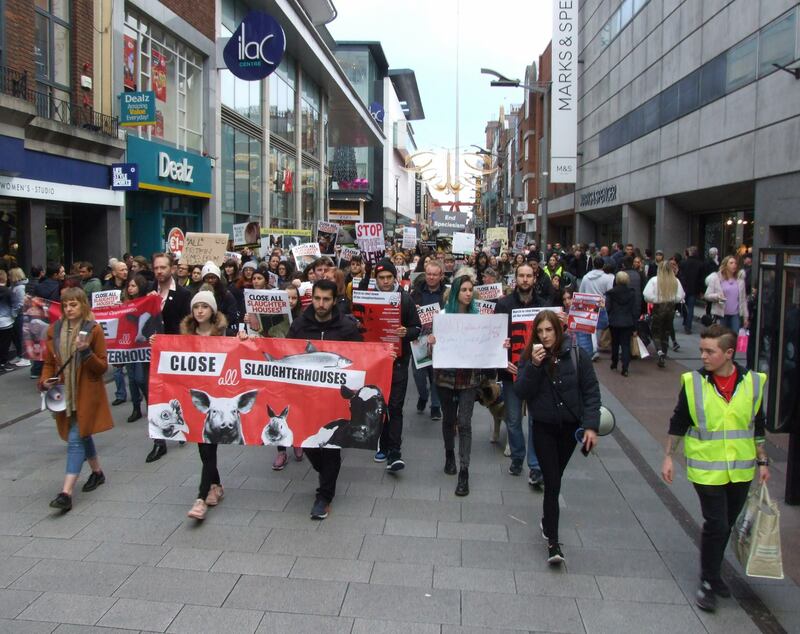 NARA are excited and honoured to be organising Ireland's fourth 'March to Close all Slaughterhouses' in Dublin, as part of an international campaign to abolish the meat industry. WHY: As a society, we have marched against sexism, racism, and homophobia. Now, we ask you to join us to march against another oppression: speciesism. Our fellow non-human earthlings desperately need us to act against their continuous pain and suffering at the hands of a meat-eating society. Meat consumption causes more suffering and death than any other human activity and is completely unnecessary. Animals are not ours to consume - they are living, breathing, feeling creatures who did not volunteer themselves to become another item on your plate! Often people don't think of the pain and suffering "farm" animals have to go through. Why love one animal and kill another for food? Pigs and dogs are so much alike, yet pigs are abused and killed just for meat, while dogs are considered companion animals. It is estimated that every year 1,000-billion aquatic animals are killed worldwide. That's 1,902,588 every minute or 31,710 every second. And, even worse, it's estimated that each year 64-billion land animals are killed worldwide for the appetite of humans. (Or 121,766 every minute and 2,029 every second). But YOU can help stop this mass slaughter, by going vegan! WHY NOVEMBER: Around this time of the year, many families are planning to get together for holiday meals, which unfortunately usually involves animals. Let’s get them thinking about cruelty-free alternatives with vegan guides and outreach before the holidays. MATERIALS: We will have some signs but please be creative and make your own to show how you feel about the meat industry. - HUMANE MEAT IS A LIE! - ALL ANIMALS HAVE A RIGHT TO LIVE! - EATING MEAT IS NOT GREEN! The march is organized by National Animal Rights Association.